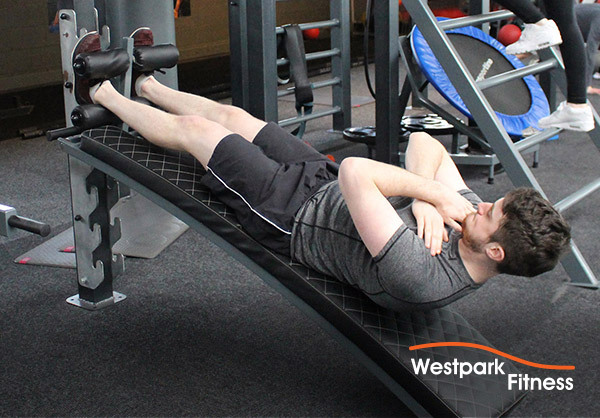 You may have seen this piece of equipment on the gym floor on Westpark Fitness – it is the sit up bench and it is used to target your abdominal and core muscles. It also helps to target your obliques (the muscles on your sides that sit on both sides of your abdominals) as well as your hip flexors. As such, adding it into your fitness routine is a great way to give some dedicated attention to your midsection. As you can see in the picture above, you can hook your feet into the end bars of the sit up bench. This is your starting position and it keeps your body in place to complete the sit up movement. With your feet hooked in, lie down flat on the bench. Cross your arms across your chest, brace your core (imagine you were about to be punched in the stomach and you are bracing yourself for the impact) and crunch upwards using your abdominal muscles to raise your head and shoulders off the bench. It is important to remember that this movement should be driven by the abdominal muscles. If you simply raise your head and neck without driving them forward using your abdominals, you risk straining your neck as it is unsupported without your core being activated to power the movement. Please ask any of our gym staff if you need assistance and they will be happy to demonstrate and guide you through the correct movement. Once you are comfortable with the correct movement, you can incorporate the sit up bench exercise into your routine. Complete sets and reps with it to target your core, abdominal and oblique muscles and your hip flexors. With this, there is yet another piece of equipment that you can master at Westpark Fitness to help reach your health and fitness goals. Want to join a premier fitness facility such as Westpark Fitness to reach your health and fitness goals? Click / Tap here to book a FREE tour!